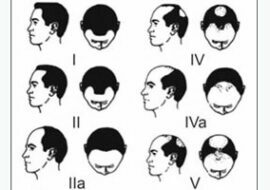 The ubiquitous Receding hairline seen in aging men is caused by a form of hair loss called androgenetic alopecia or male-pattern baldness. It’s the most common form of hair loss and most men will experience a degree of male-pattern baldness at some point in their lives. For some men, a receding hairline is just the beginning. The hair loss may extend over the crown of the head and only leave a horseshoe-shaped area of hair growth in the sides and back of the head that is characteristic for advanced male pattern baldness. For a rare few, most of the hair on the scalp may be lost. But what exactly causes this kind of baldness? Introduction: Despite not being known as a life-threatening condition, hair loss has been considered to be one of the most prominent aesthetic problems known to mankind. Many individuals with hair loss experience lack of confidence and anxiety and fear their first impression on people are impacted by their problem. To this date, there have been no descriptive guidelines or researches regarding the hairline morphometrics of Turkish population. With the results of our research, we aim to aid hair transplantation operations with accurate information on hairline morphometrics, thus giving hair frontlines a more natural look. 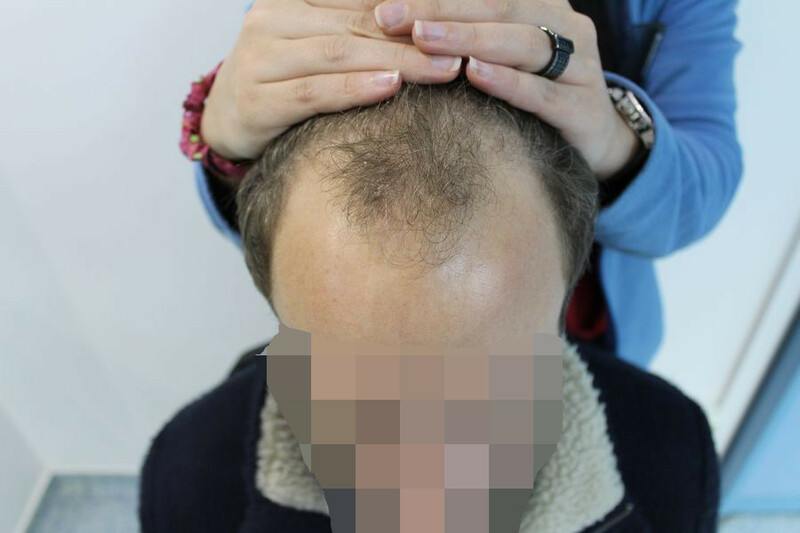 Materials & Methods Randomly chosen 138 Turkish males aged 18 to 25 with no prominent hair loss (any hair loss score above ‘1’ in Norwood was considered prominent) and measured specific reference points of their hairlines. All measurements were performed with a digital caliper. SPSS (Statistical Program for Social Sciences) for Windows version 15.0 was used in statistical analyses. A p-value < 0.05 was considered significant. The overall measurements were evaluated with Man Whitney U Test. Measurements can be seen in figure 1. 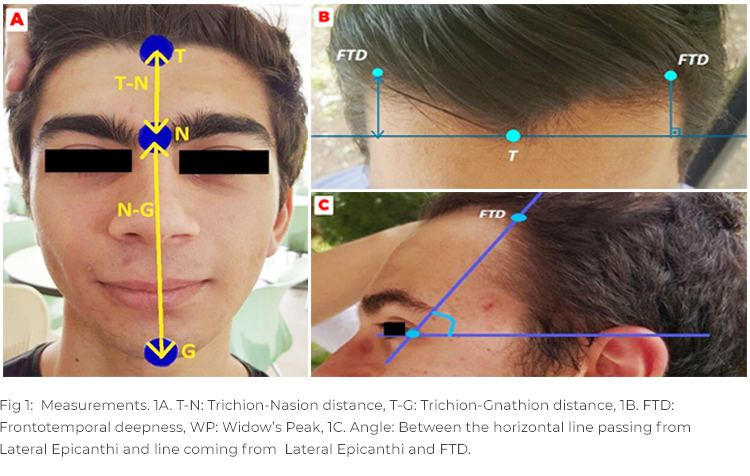 Results Trichion-nasion (T-N) distance, trichion-gnathion (T-G) distance, widow’s peak sizes, frontotemporal deepness, angle between the horizontal line passing from lateral epicanthi and line coming from lateral epicanthi and frontotemporal deepness were measured. The average length of the T-N and T-G distances was found 65,3 mm and 186,03 mm respectively. The width and length of the widow peak were 18,94 mm and 11,85 mm. Length of the frontotemporal deepness was 39,50 mm for the right side and 38,83 mm for the left side. And the angles were 66° for both sides. 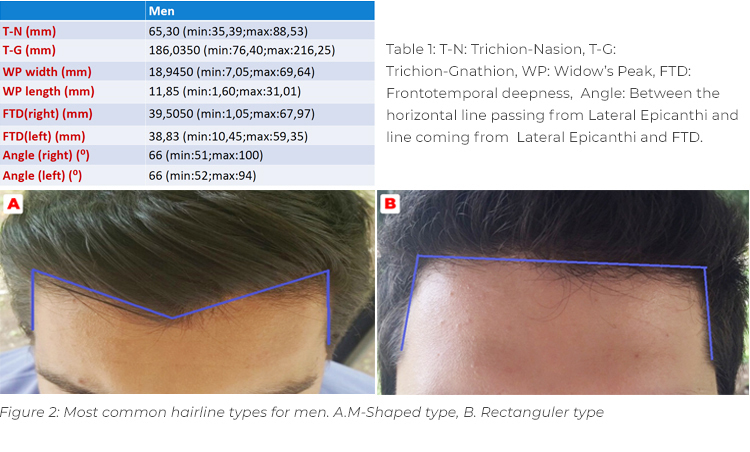 We have also determined the most prominent hairline types in men rectangular (55,1%) and M-shaped (42,8%) hairlines (Figure 2). Only 2,2% of the men have round shaped hairline. All morphometric results can be found in table 1. Conclusion We conclude that, rectangular and m-shaped hairlines resemble a more masculine appearance. With the findings of our research, we believe hair transplants would be delivered more successfully on patients. Androgenetic alopecia is a form of hair loss caused by an inherited genetic predisposition and aging. This type of hair loss is caused by the action of male hormones on hair follicles, that’s why it is so common in men compared to women. In the body, testosterone is converted to dihydrotestosterone (DHT) which is more potent than testosterone. DHT then binds to receptors in hair follicles in the scalp to cause baldness. DHT causes the hair follicles to shrink by shortening the growing phase of the hair before it gets replaced. The increased levels of DHT progressively reduce the growth phase causing the hair to reduce in length and thickness in every successive hair cycle. Eventually, the hair becomes so small that it doesn’t reach the surface of the scalp, leading to an appearance of baldness. Those who are genetically predisposed to androgenetic alopecia usually have hair follicles that are very sensitive to the effect of DHT. That being the case, the levels of male hormones don’t have to be high to affect the hair follicles. That’s why androgenetic alopecia also affects women even though they have very small levels of male hormones circulating in their bloodstream. In women, androgenetic alopecia doesn’t present with a receding hairline but instead, there is diffuse hair loss radiating from the top of the head while the hairline is maintained. 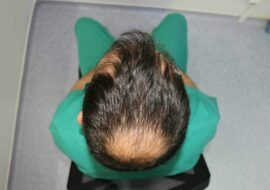 Hair Transplant for Receding Hairline? FUE hair transplantation is gaining more and more traction among the male population every year. 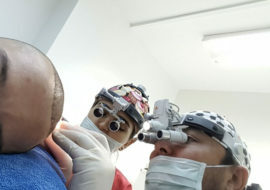 It is a permanent method of replacing lost hair that actually looks natural instead of the ungainly clumps of hair associated with the prior methods of hair transplantation. 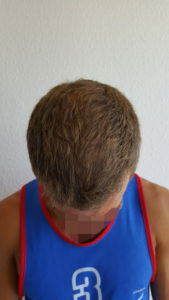 FUE is a minimally invasive procedure that transplants follicular units of hair from the donor area to the balding area. Since the hair in the donor area is naturally resistant to the balding process, you don’t have to worry about balding once again after the procedure is done. Its effectiveness has made FUE the ultimate solution to the problem of hair loss and Receding hairline among men. It barely leaves any scars and the recovery time is very quick. Men also don’t have to worry about the shaving of hair in the donor area during the procedure. After all, a new haircut is a small price to pay for the restoration of your hairline. FUE is still very costly and the price depends on the extent of hair loss and the number of sessions required. You’ll be wise to avoid waiting too long since if the balding process gets too extensive, the procedure will be much more expensive. Topical Finasteride, the new hairloss medication?